Here’s a link to a balearicy kind of mix of downbeat, soul, pop, reggae, dub and breaks done just because the sun is shining. Ideal for BBQs, ironing and biscuit baking. 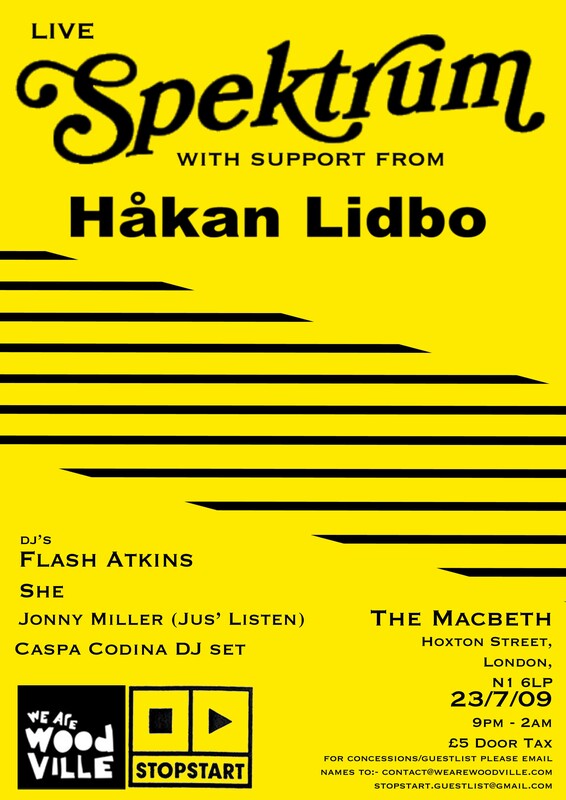 We Are Woodville rocked the rafters at Hoxton’s Macbeth pub – Spektrum played live with Hakan Lidbo from Sweden…. Flash Atkins is a super hero who had his gravy days in the 80s saving the world with his ability to manipulate sound. Unfortunately he’s fallen on hard times and can be spotted in the less salubrious parts of London, Manchester and West Yorkshire stoned or drunk on borrowed time & money. To make ends meet he uses his special powers to DJ, remix and make tracks for We Are Woodville and PAPERecordings. The Sweetshop is his new single and is a concise slice of low-fi electronic pop sitting in the hinterland somewhere between Hot Chip and Calvin Harris. Gabriel Olegavich’s alterego, Caspa Codina takes time out from producing Spektrum, Lady Sovereign and Envy to provide vocals. On the remix front, Håkan Lidbo goes mainfloor with a glitchy 4/4 bass driven thumper, Radioproof veer off in to Hoxton Pop territory and new kids Dieter & the Gadabouts take it deep, big and bouncy. Flash Atkins also has a crack with his Into The Valley version that takes different types of house, sticks them through the mixer and emerges with a whole load of disco attitude and something that The Juan Maclean would be proud of. Sign up to http://flashatkins.blogspot.com/ for tales of woe, shite superhero videos, live dates, releases, DJ mixes, exclusive tracks, podcasts, bacon sandwiches, bags of coal blah blah blah blah blah. Buy it at iTunes today!